January is the best time to plant onion slips! Homegrown from your garden tastes best! Are you planning to maintain your landscape organically in 2015? If so, a great benefit is that you can incorporate edibles into your ornamental landscape without the worry of contamination. Often, our landscape soil is too compacted and sterile to support vegetable production. By enriching and building the soil organically in all of your landscape beds, you can turn them into beautiful and productive spaces. Here in the Dallas area, we’re lucky enough to have a 12-month gardening season. Each month throughout the year, there are vegetables, fruits and herbs to plant. Don’t have a dedicated vegetable garden? Again, consider blending edibles in with your other landscape plantings. Add salad greens as a delicious landscape border; plant broccoli in your cool season containers as a companion to your violas; and tuck tomatoes into your sunny perennial beds come spring. This month, you can plant broccoli, cabbage and leafy greens such as kale and spinach, but one of our favorite veggies to plant in January are onions! Getting your onions in the ground at the right time is crucial; they must experience certain temperatures and day lengths in order to form bulbs. If you wait too long, you’ll miss the planting window. Try and get your onions in the ground by the end of January or first week of February. If you want to plant onions by seed, you’ll need to start them in October. 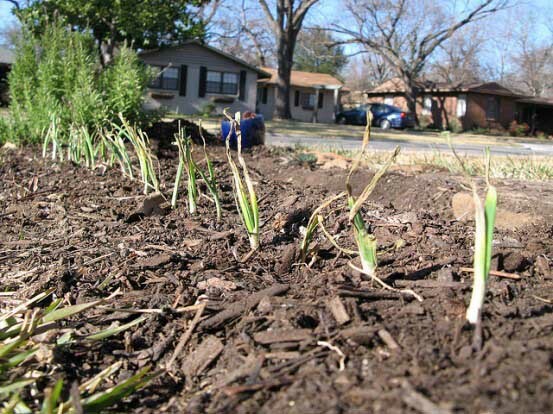 Onion transplants, or slips, can be found in local garden centers across the DFW area. When choosing between long and short day varieties for North Texas, choose short day onions as they produce best..
To start, onions grow best in well amended soil. Landscapes that have been on our Soil Building Program will have a jump on healthy soil! Adding lava sand, compost and a quality organic fertilizer will encourage healthy growth. Just the green tops will show after planting about two-inches deep. To plant use a pencil to make the hole. Push the pencil about two-inches into the soil and only as deep as the white growth at the base. Place in one onion slip roots down, then pat into the soil gently. How much space do they need to grow? Plant in rows 12-inches apart and each slip four to five inches apart. Leave about 6 to 12 inches around each plant to allow for the onion bulb to grow. Water needs are simple. To properly develop fully formed bulbs, water regularly and thoroughly, but be sure not to overwater and allow the soil to be washed away. Onions feed heavily on nitrogen to properly form a bulb. First feed them about three weeks after planting, then every two weeks after that. Roughly four weeks before harvesting, stop feeding. Another indicator to stop feeding is when the necks of the bulbs begin to soften. For smaller onions, such as cocktail onions, harvest mid- to late-spring. 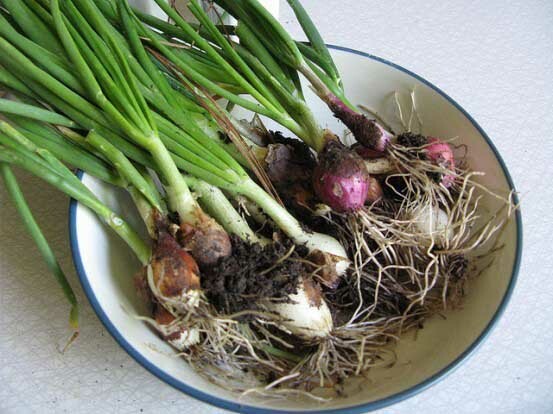 Harvest young green onions by planting extra slips and harvest them about four to five weeks after planting. Never harvest the green tops off of the plants as they need this to store energy to form the bulb. Full size onions can be harvested beginning in early summer. Harvest before plants flower. Because onions are biennials, they grow vegetatively the first year and form flowers the second year. Once onions begin to flower, they’ll stop producing bulbs. Planting easy onions are a great way to get the whole family involved in gardening. Check back here at our blog or on Facebook and Twitter for more organic gardening tips though the seasons.